It's Donna here, can you believe we are almost at the end of January......here in Virginia, we have not gotten any snow and it has been relatively warm for this area. I am enjoying it while it last, because we still have February to go. I am here sharing another Valentine card. I know I have told you before, but I love the colors of Valentine's, I love red and pink with black. Today, I am sharing with you a red and black card. 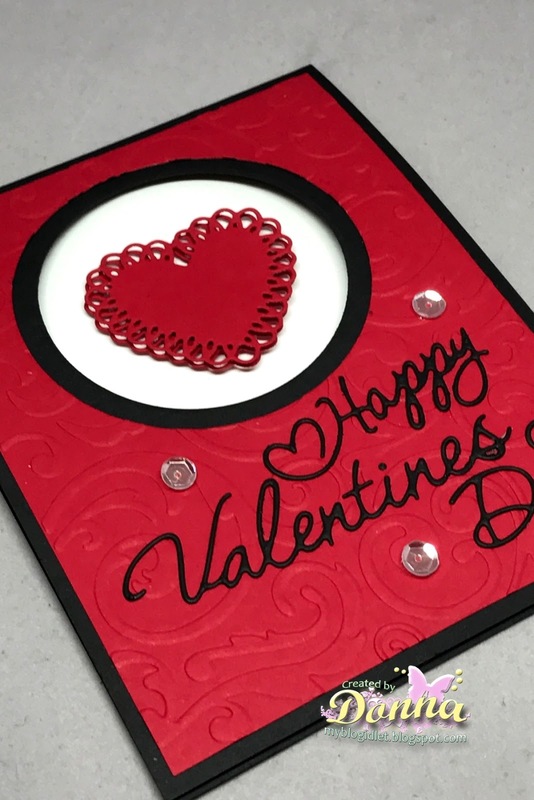 There are several newly released Valentine dies that you just have to see. 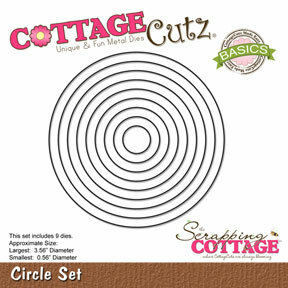 Go over to the CottageCutz store and check them out. Right now the Valentine release is 25% off! 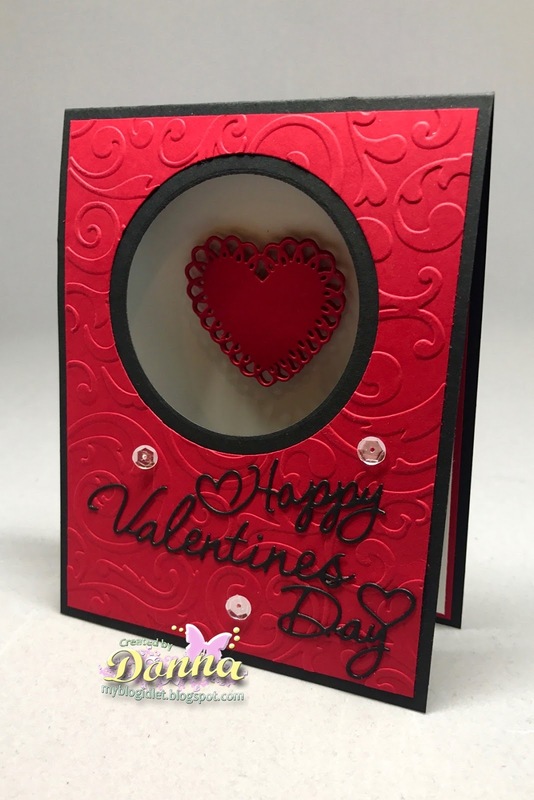 I am using the new CottageCutz Fancy Heart and the Valentine's Day Phase on my card. These sets are adorable and so easy to assemble. See below on how I put my card together. 1. My card is an A2 card (4 1/4 x 5 1/2). I cut a layer (red), which measures 4 x 5 1/4. I die cut all the pieces I need for my card. 2. 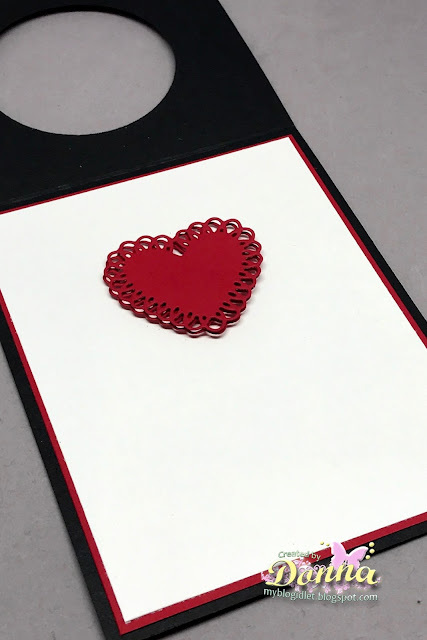 I wanted to create a frame in the front of my card, so I took the fourth circle to the largest from the CottageCutz Circle Set, found the center of the card. I used some re-positional tape to keep the circle from slipping. 3. After I die cut the circle, I took the red layer from my card and die cut another circle using the third to the largest circle. I die cut the circle, embossed it and adhered the layer onto the black card. 4. I cut out two of the "Fancy Hearts", I used some foam tap and put the two hearts together. This would give the heart more dimension. 5. I have a little trick for all those intricate dies. The "Valentine Phrase" die is some intricate and dainty, I took some double stick tape and put it on the back of the black piece that I was cutting the sentiment out of. I laid my die on the top of the black piece and ran it through my die cutting machine. 6. When I took the paper away from the die, this is what it looks like, the adhesive is already onto the words. I added this onto my card and finished it off by adding some sequins. Beautiful - I love that little heart. Your window card is so pretty. Love the window on the front that allows the heart to show through. Beautiful Valentine!